Move over spiralized zucchini! There’s a new vegetable based pasta substitute that is even more delicious and comforting. Seriously, now that I’ve discovered the joy of cabbage, I don’t think I’ll ever feel the need for a bowl of pasta again. I know it sounds unbelievable. But I dare you to try it. The cabbage cooks in about half the time it would take to boil a pot of water and cook spaghetti. Just saying. Oh and normally for carbonara pasta dishes you only use the egg yolk so you get a lovely rich creamy sauce. With the cabbage, I prefer to use whole eggs so you don’t have to find a home for the extra whites and because I think the slightly chunkier texture works well with the cabbage. 1. Heat a little oil in a large saucepan. Cook bacon over a medium high heat until well browned. A few minutes. 2. While the bacon is cooking, finely slice cabbage into ribbons about 1/2cm (1/4in) thick. No need to be super precise. 3. When the bacon is browned and starting to go crispy, remove it from the pan and drain on some paper towel. Add cabbage to the pan with 1/3 cup water. Cover and cook on medium high until the cabbage is soft or ‘al dente’ – about 10 minutes. Stir a few times during the cooking process. 4. Meanwhile whisk eggs and parmesan in a small bowl. When the cabbage is cooked and the water has evaporated, reduce heat to medium low. Add eggs and cook for 30 seconds on medium low heat until almost set. 5. Taste and season if needed, remembering the bacon is going to add more salt. 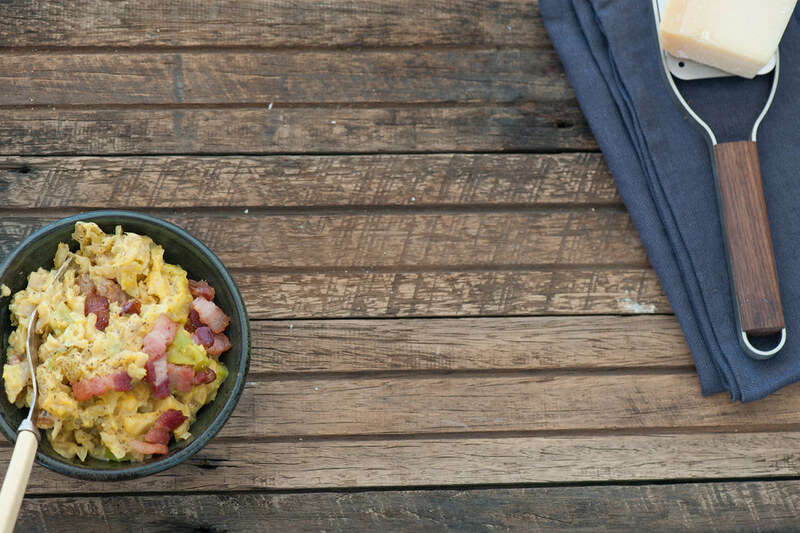 Serve eggy cheesey cabbage topped with crispy bacon. WINE MATCH: A nice big red like an Australian Shiraz or a Californian Zinfandel. 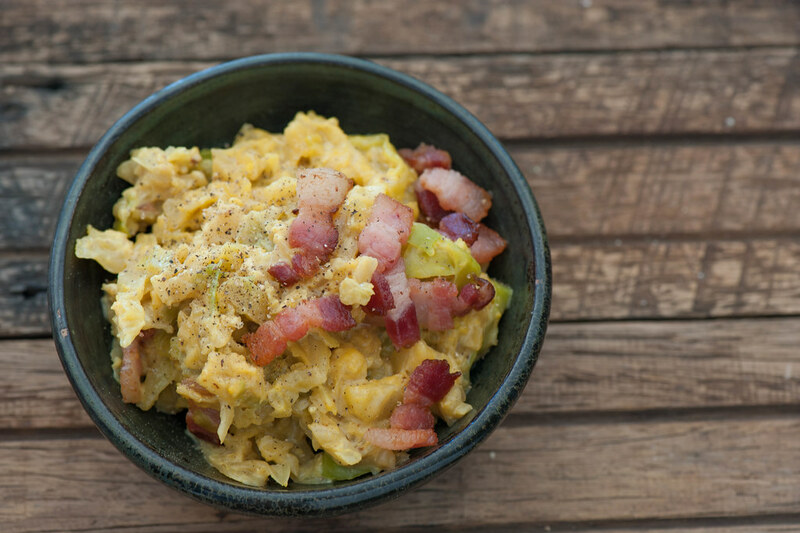 short on time – cook the bacon and cabbage at the same time in separate pots. Use pre-shredded cabbage or coleslaw mix instead of slicing yourself. vegetarian – replace bacon with smoked tofu, smoked almonds, sun dried tomatoes or roast red peppers. dairy-free – skip the cheese and serve with toasted almonds on top or try serving with my Brazil Nut ‘Parmesan’. egg-free – replace eggs with 6-8 tablespoons cream or butter. And serve with some roasted nuts or cooked chickpeas for extra protein. more substantial (carb lovers) – toss in cooked spaghetti or other pasta. more substantial (low carb) – toss in roast almonds or other nuts. Or use 6 eggs. herby – lovely with chopped chives or flat leaf parsley. different veg – halved brussels sprouts or cauliflower will also work. I also love a kale version using finely shredded cavolo nero leaves and stems. You can but best when freshly made. If you need to prepare ahead just cook the cabbage and bacon as per the recipe but keep them separately. Will keep in the fridge for 2 weeks or can be frozen. To serve, warm the cabbage and bacon in a pan then add eggs and parmesan as per step number 4.